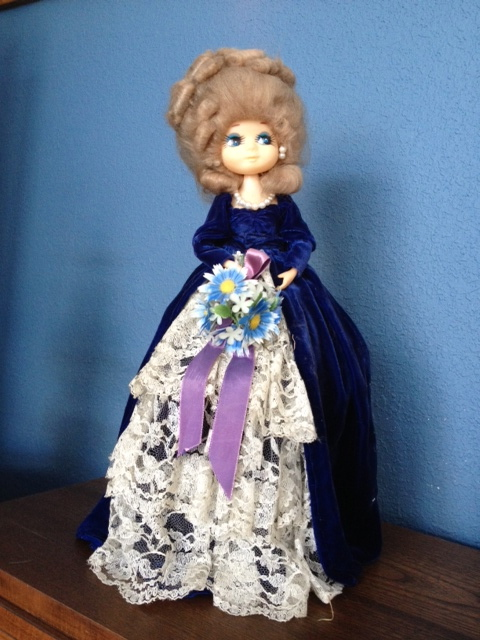 This is the doll my mother made from an old dress of mine and her own wedding dress. Just take this doll, for example. Who would ever want it? It is actually hand-sewn fabric over an old plastic milk bottle. BUT, the blue velvet is from the only “good” dress I had as a little girl. My sister had one just like it and when she grew out of hers she had to wear mine for a few years!!! We knew when we got to wear this dress with our black patent leather shoes it was a special day, such as at Christmas time. Then, the lace is from my mother’s wedding dress. I will never forget the joy on my parents’ face when, after we had walked in adulthood for many years, they presented my sister and me with these gifts. This is mine with blond hair. My sister’s is just like it with brown hair. I have considered what to do with it but my arm does not seem long enough to take it off the shelf where it sits. It really doesn’t take up much space, except in my heart. This entry was posted in Stories and tagged Christmas, doll, dress, heart, love, parents, present, shoes. Bookmark the permalink. Seems to me like this doll is something very precious and worth more than most costly things. It is loaded with memories and love. And keeping it honors your mother as it was a gift from her heart – it feels precious to me that she would even offer such a gift to you (plastic milk bottle body) when you were an adult; it shows an innocence/trust that is much lacking in our cynical world. This is a wonderful glimpse into the heart of your mother. Sorry, I just can’t recommend that your arm grows long enough to reach it and take it off of the shelf. Thank you, Laurel. Your insight into my Mom’s heart is precious to me. She was a first grade teacher for 30 years and maintained a child like wonder that took delight in things most people would not notice. I am wondering where your things are that you needed to leave as you moved to another country and how you decided what to keep?